As we venture into Autumn and the weather begins to slowly cool down, it is the perfect time of year to consider a fire pit addition to the backyard, allowing multi-seasonal use of the external space. In essence a fire pit is simply a small enclosed area that contains an open fire, which of course can vary in size and appearance – depending on the look you desire. Fire pits can easily be created from scratch or be purchased from your local hardware store if you want to keep it simple. However, if you are intending on implementing a permanent backyard feature, then landscape professionals can custom-design and build a permanent pit at your location of choice. As seen in The Evolution Farmhouse…. 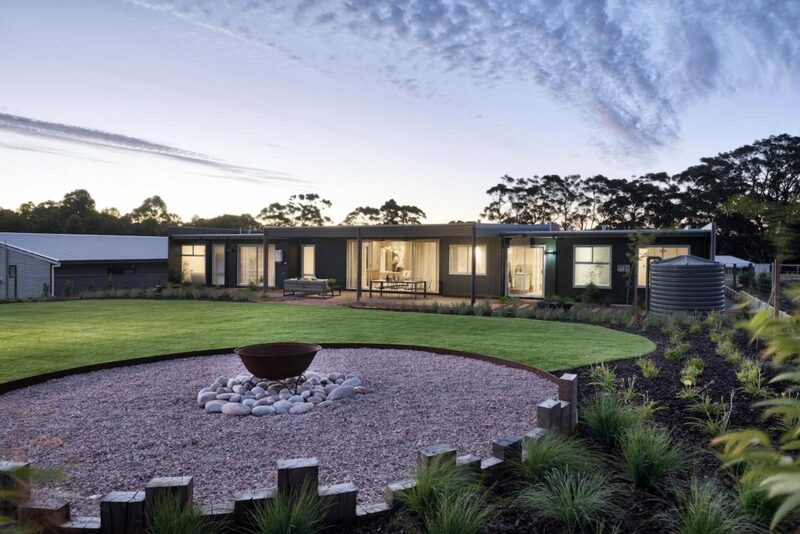 For a modern fire pit inspiration, turn to one of our recent display homes The Evolution Farmhouse which features a beautifully finished, contemporary pit that is set towards to the back of the property, away from the alfresco facilitating an extension of outdoor entertaining and multi-seasonal use of the entire external space. Fire pits can be manufactured from glass, iron, copper brick or stone. It also burns a range of different fuels, such as wood, charcoal, propane gas or gel – wood and gas typically being the most popular options. There are a range of fire pit designs and sizes to suit different people and their intended purposes for example if the pit will predominately be used by a small family or regularly be an entertaining point for a number of guests. Other design elements to consider is the material or shape of the pit and the impact upon the external setting as well as the amount of seating required for the space, given the area and estimated use. The aroma of a wood-burning fire pit creates the ‘great outdoors’ camping feeling in the comfort of your own backyard and can also serve as an outdoor cooking option. Propane gas pits create a unique bluish flame and with additional fuel, can become large and dramatic in size which produces an incredible focal point for all to enjoy. The impact can be increased with the use of non-flammable decorative materials, such as coloured glass or pebbles in the pit. It is highly important to ensure that the fire pit is set up correctly and used in a safe manner. Always follow the manufacturer’s instructions and contact your local shire (no matter the location) to be informed about any restrictions that may apply such as set-backs from boundaries that could interfere with the intended positioning. Also make sure the fire pit is established on fire-resistant material, such as concrete, gravel or brick. Once all these elements have been considered, sit back and relax all winter long with your fire pit.